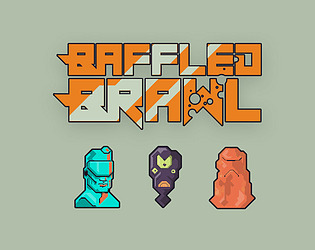 The second annual Seattle Indies Game Jam arrived at many unexpected results! 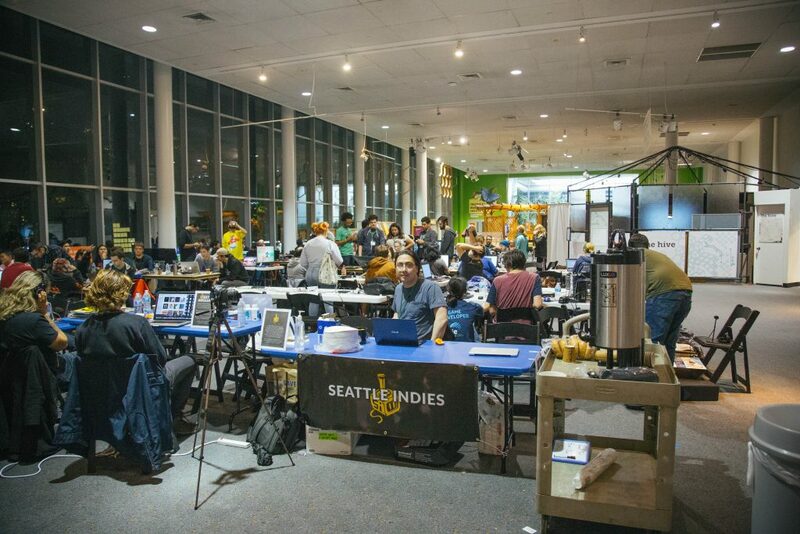 The Seattle Indies Game Jam 2018 was created for and by the Seattle Indies community. 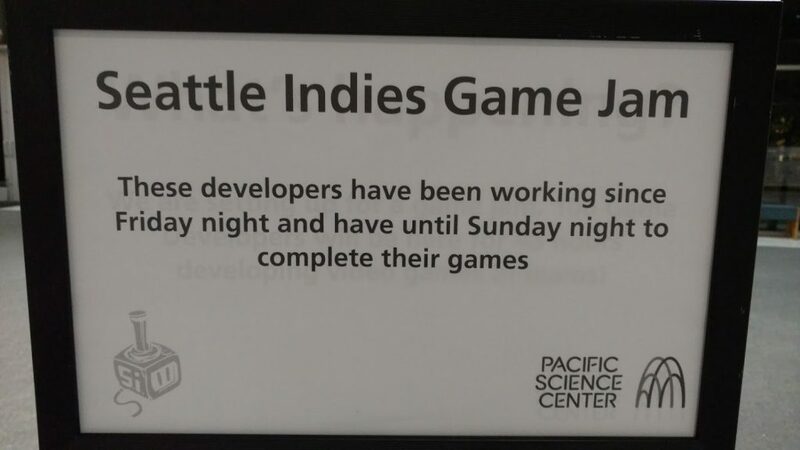 Game Jam, with the hashtag moniker #sigj2018 and hosted in the Ackerley Family Exhibit Gallery of Pacific Science Center, was a collaboration among over 100 videogame developers and curious minds of various technical or creative disciplines also called “game jammers.” Game jammers met and built 23 games in teams, or individually, over the course of two days – from 7 PM on Friday November 2nd to 6 PM on Sunday November 4th – based around a central theme: Unexpected Results. Of the event, which sold out early, Seattle Indies Vice President Tim Cullings said, “close to half of the jammers tonight were first-timers, and most of those were first timers for Seattle Indies as well.” Games made in game jams can usually be played in anywhere between 5-minute escapes to multiple-hour multiplayer games and are usually short, experimental games that, even without the theme of Unexpected Results, are more about trying out a single technical or creative idea than accomplishing anything big. 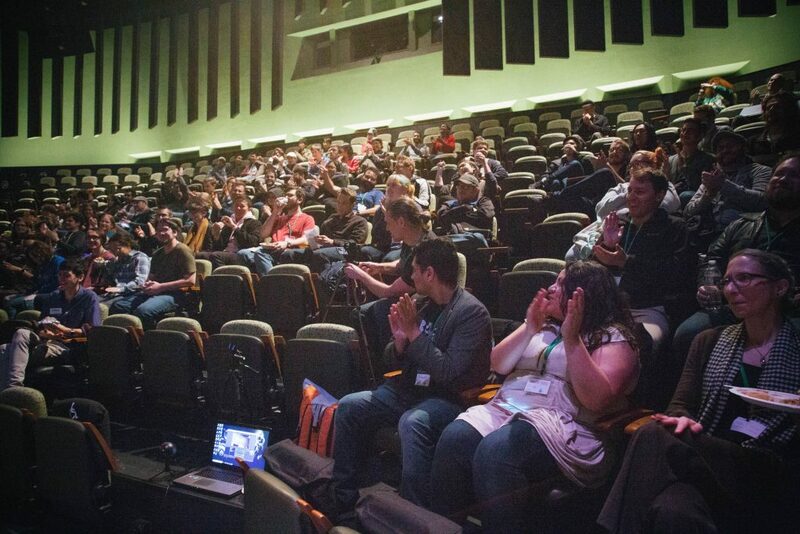 The game jam location and time frame can change aspects of game development in multiple ways. 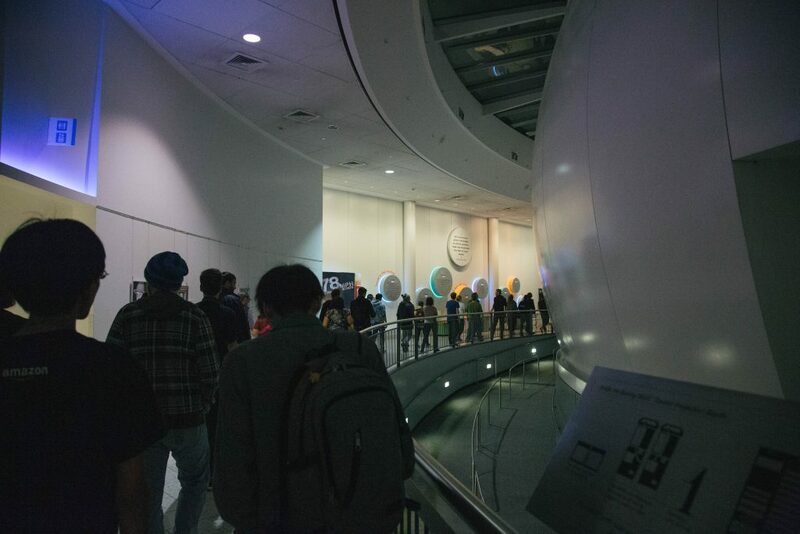 The location can affect the productivity, motivations, and creativity of game jammers with Pacific Science Center being a venue that consistently inspires creativity for people of all ages! The time format of two days inspires bursts of creativity. On Friday night, everyone was ready to go and worked well into the night. Some teams were awake as late as 4 AM on Saturday morning, then back to work at 8 AM, and working until 3 AM on Sunday morning. Sunday afternoon was crunch time to ensure games could arrive at a “minimum viable product” state for publication on the Seattle Indies itch.io page. Additionally, the limited window for creating a videogame can change development workflow. The focus isn’t on polished perfection, rather, creating a functioning minimum viable product before the deadline. 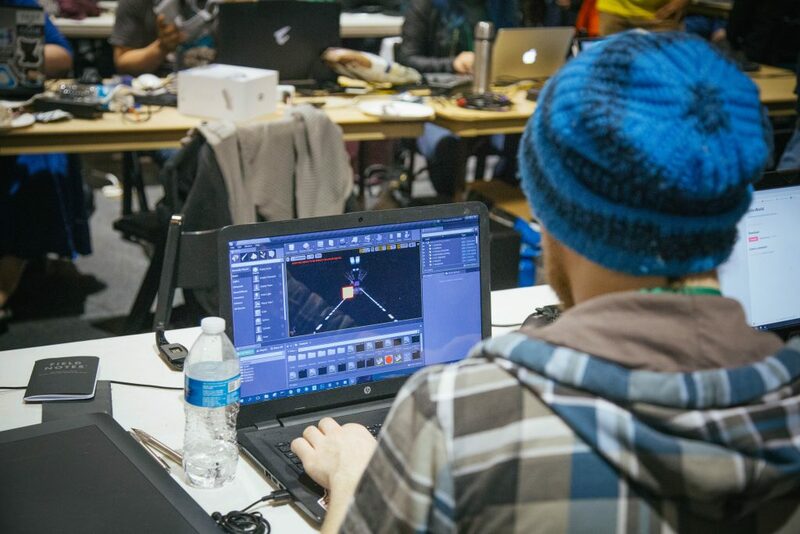 Game jammers must balance creating an ambitious enough project to impress while completing their game on time! 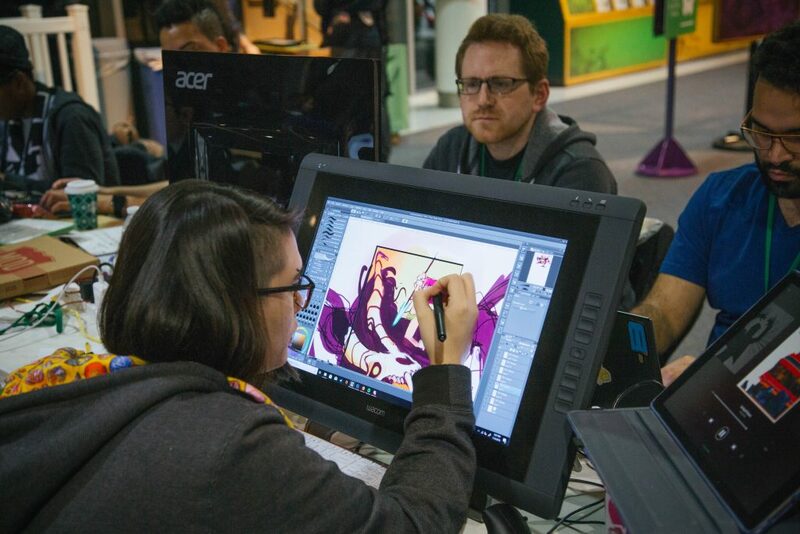 Some programmers will spend time after the game jam to polish their games and publish to other distribution platforms, while others will move on after completing the project. As Tim clarified, game jammers “will retain the rights in case they want to sell the rights to their games on any sort of gaming platform, but most just want to work on games for fun.” This decision depends on the popular reception and of course the game jammers themselves. 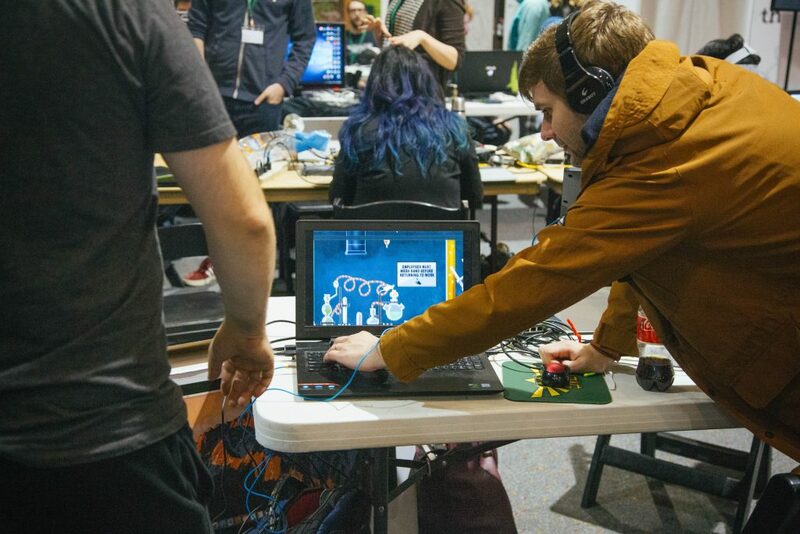 Game jams, like the Seattle Indies Game Jam, are a microcosm for how larger-scale game developments operate. They are a brilliant opportunity to test the waters in building games over the course of a radically short period of time. Many of the same development cycles featured above appear in larger, AAA studios – coming up with ideas, brainstorming, overcoming problems of all sorts, the resilience to push through especially in the final hours before the deadline, and all of the “unexpected results” that happen along the way! 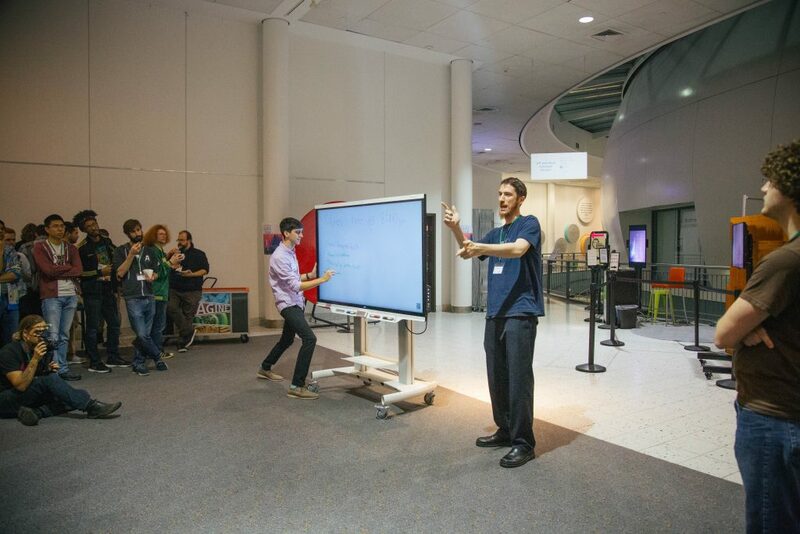 Tim and Daniel Rother of Pacific Science Center’s Tinker Tank exhibit both encouraged game jammers throughout the event with two main thoughts. 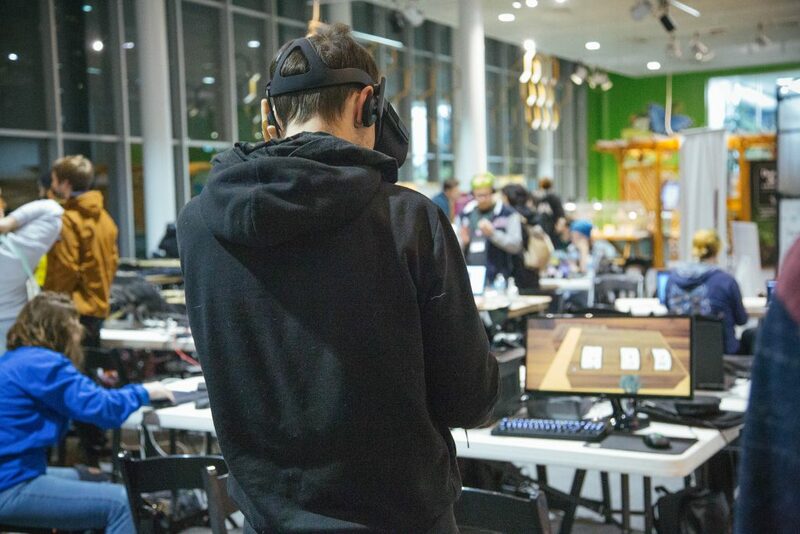 First, since the game jam was hosted during museum hours, we were encouraged to interact with inquisitive kids and family, because the jam was a living exhibit itself, showing museum guests what the game dev process looks like in action. The game jammers seated around the edge of the work area often fielded questions respectfully and professionally from children and family about the games they were working on. Second, the Seattle Indies fosters an environment where it’s OK to fail, as long as you ask for help and pick yourself back up. 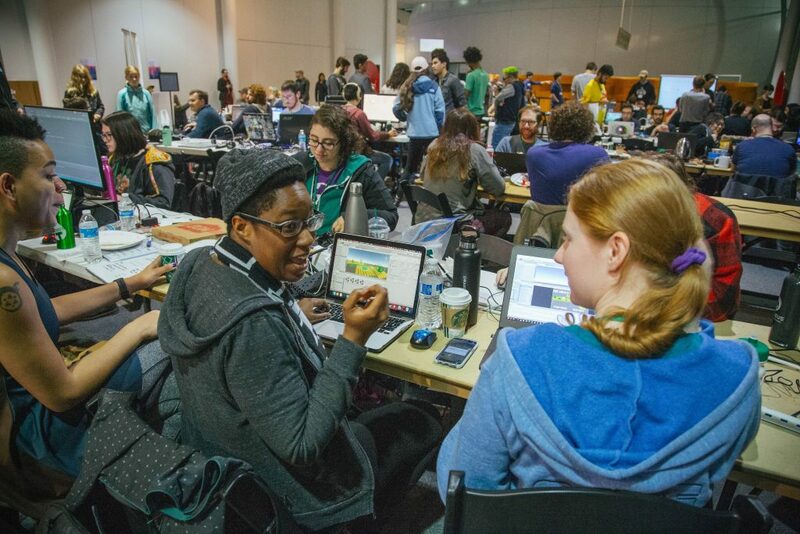 Mentors, volunteers, and other game jammers were readily available throughout Game Jam to assist with logistical, technical, or programming issues. 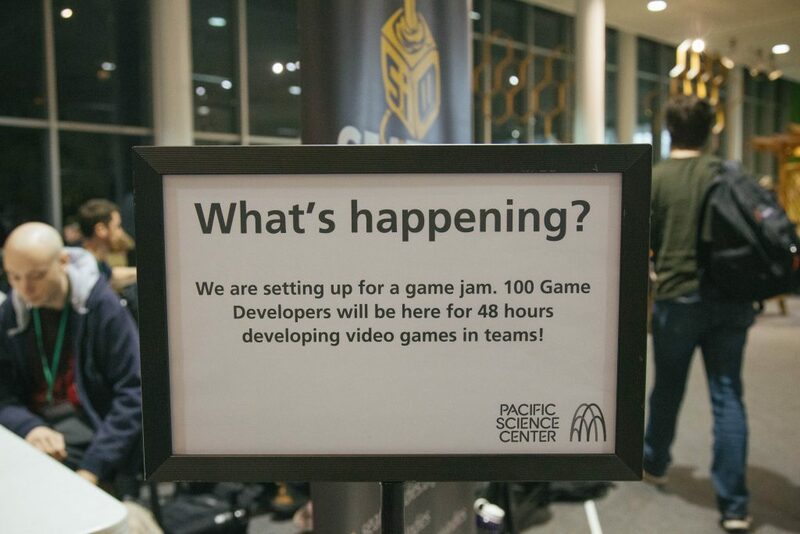 Pacific Science Center, similarly, ensured a secure space for the game jammers. During the day, there were enough people in the main area so game jammers could go out to lunch and not have to worry about their personal equipment. During the night, a security detail monitored the building and grounds. 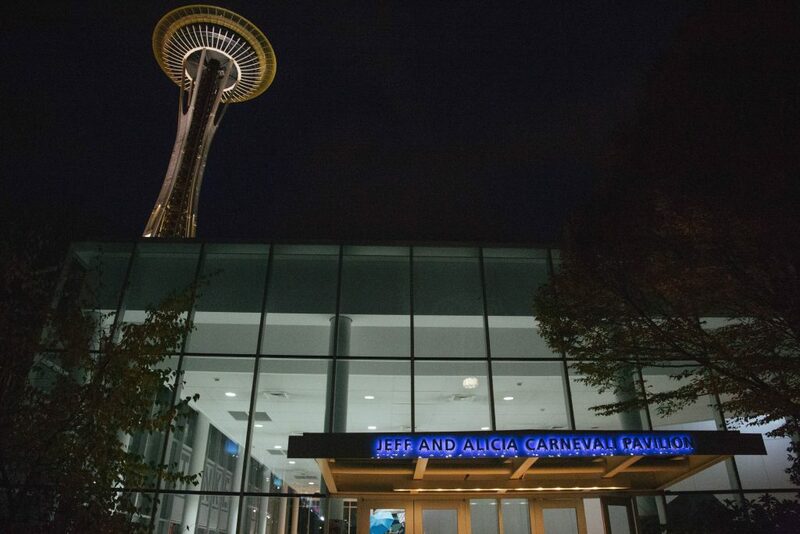 There were also Pacific Science Center employees available – Michael and Julia – throughout the night hours on Friday and Saturday to ensure the in the pre-approved sleeping areas within the building remained safe and secure. Most everyone that stayed overnight took public transportation or private transportation to and from the Seattle Center. Whereas people that drove home in the evening would park in nearby parking garages or on the street. 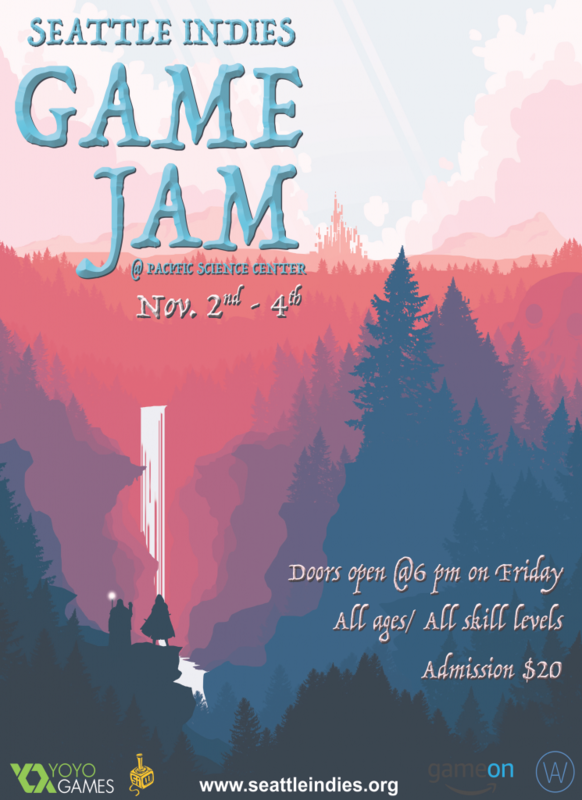 In the weeks leading up to the Game Jam, the Seattle Indies made a series of announcements on the Facebook and Meetup pages, first asking for all people to go through a background check to ensure safety as a top priority for game jammers and guests, then posting a link to a dedicated Discord channel to organize. There was a general chatroom for everyone and a looking for group chatroom for people to team up in advance. Most teams were formed spontaneously. 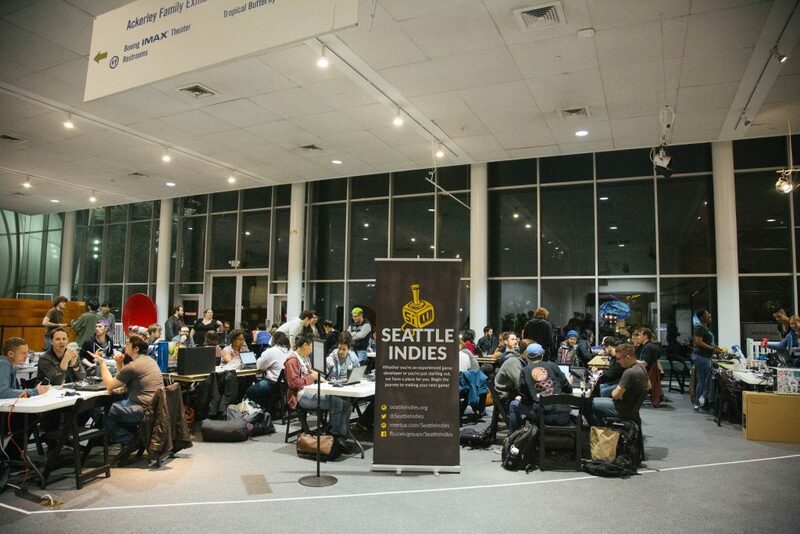 “Within the Seattle indie community and the tech community many people know a decent number of the people attending,” explained Ket Ng with the Seattle Indies, however many of the groups and individuals making these games had never worked together prior to Friday evening. 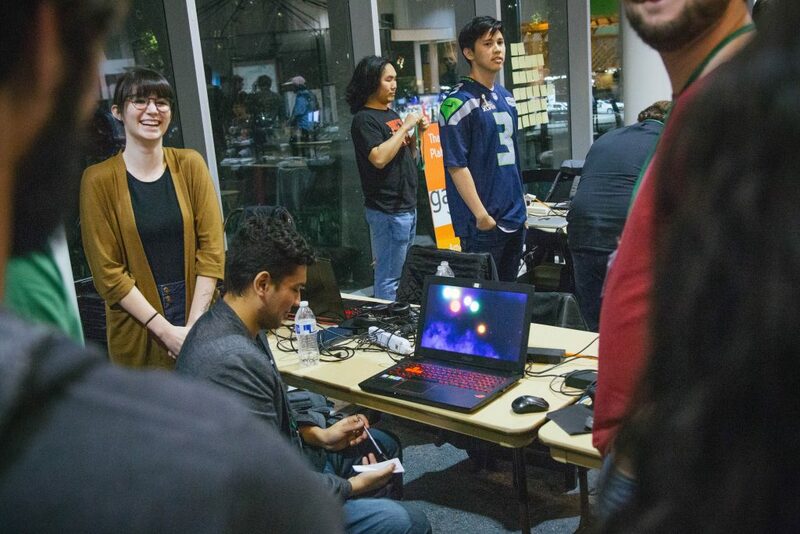 Around half were active in the Seattle Indies scene, working on other games in proximity to other game developers, but had never found the opportunity to work together until this Game Jam. 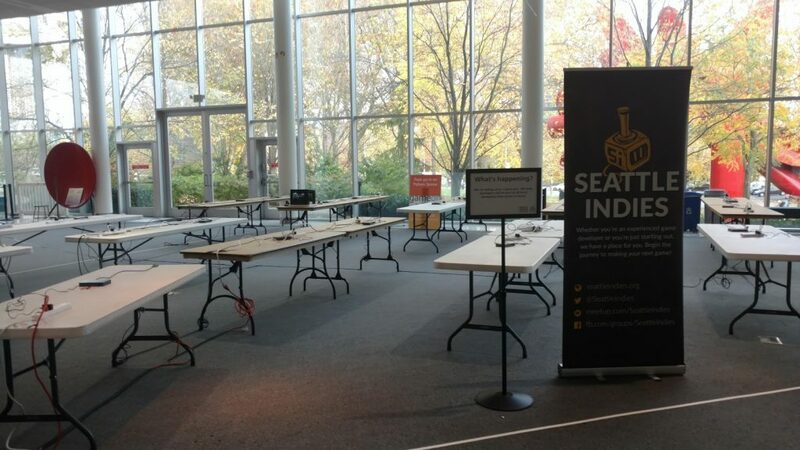 Volunteers arrived early to set up tables, chairs, and networking equipment before the official arrival time of 6 PM for game jammers. Game jammers unloaded in their equipment and prepped their collaborative tools (laptops, desktop computers, tablets, and VR stations). They also checked in with their teams, if they had already coordinated in advance via the Discord or other social media. 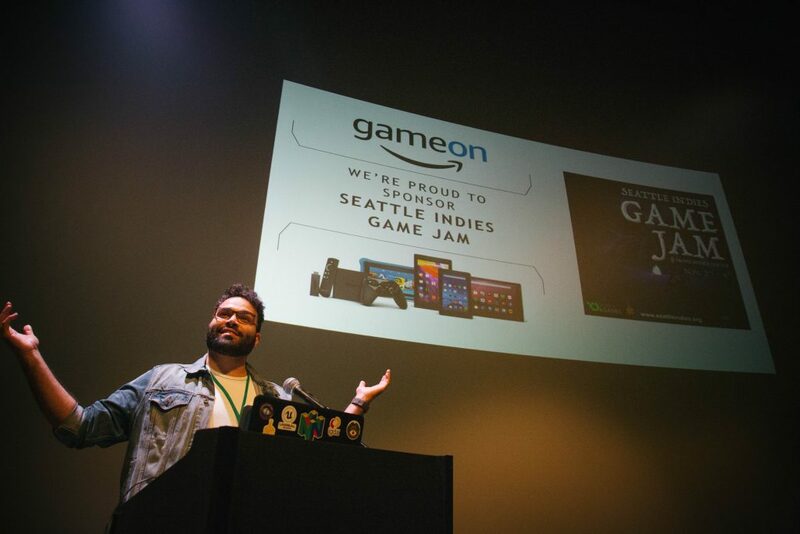 If not, game jammers met others based on common technology interests or if they recognized their friends from within the vibrant, inclusive Seattle Indies community. Security secured personal property while everyone walked over to the Auditorium for the kick-off presentation. This announcement ceremony was presented by Tim, along with a quick word from Abdullah Hamed, one of the Game Jam sponsors promoting Amazon GameOn. Tim reminded us that Game Jam was hosted during museum hours. We were encouraged to interact with inquisitive kids and family because “you are an exhibit.” We covered logistics about building access both during museum hours and outside of museum hours, locations of bathrooms, and sleeping areas for both outside of museum hours and during museum hours. There were a handful of themes suggested by our Patreon donors and voted on by members of the community in the month leading up to the jam. The winner of the theme was “Unexpected Results,” which was presented in a humorously unexpected countdown fashion. Tim concluded the presentation with a note that on Sunday evening, after dinner, all of the games would be presented in the auditorium and streamed on Twitch and later uploaded to Youtube. – Beverly presented the idea of “unexpected results in a room where you’re tasked with doing something simple in VR Oculus Go.” Her team had a coder, Unity developer, sound and VR experts. They needed a 3D modeler. This game became Elemental Forest. 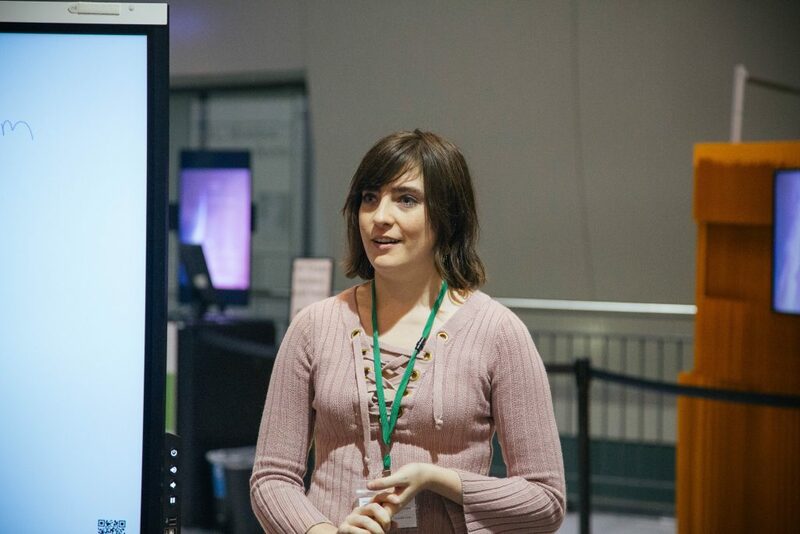 – Cami presented the idea of a “lab rat reverse gravity disaster party.” Her team had a 2D artist, writers, two programmers, and sound designer, and needed a 3D background artist/modeler and level designer. This game became Knockout Mouse. – Clinton presented the idea of an “off-rhythm rhythm game where you’d heal people with bullets and it’d have crazy sound effects.” This game became Dr. oFFbEET. – Darsh presented the idea of a “random box fighter.” Darsh had a programmer and programmer/artist/modeler, but needed everything else. He ended up joining the team working on A Wizard Fighting Cowboys, which was an idea that Rob presented near the end of the pitching phase. – David and Po-Chen presented the idea of a “bar fight game.” They had collaborated together in the past and had 2D and Unity experience, but needed a composer, animator, and programmer. They used their #bar-fight-game channel to build the game that became Bug Light Saloon. – Olin presented the idea of a “bungee jump into the abyss and unexpected things happen.” He had a programmer (Olin) and music (Cameron), but needed an artist (Julie). This game became Goblungee. 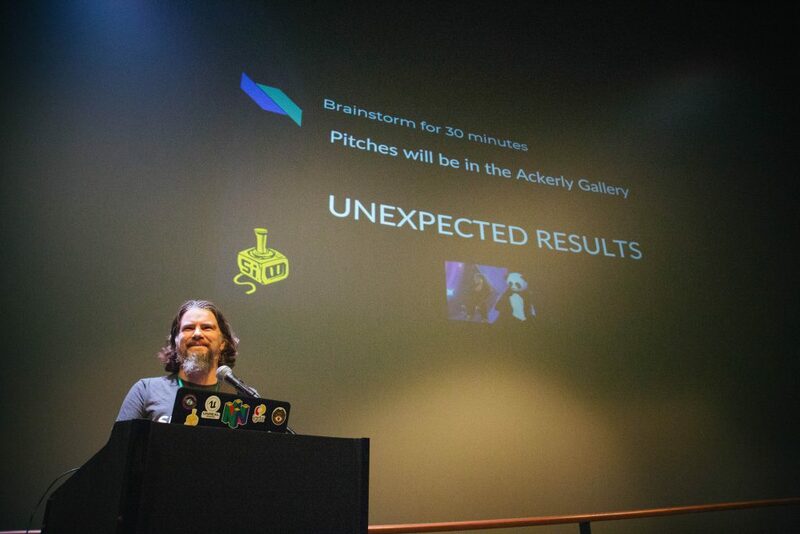 – Spencer presented the idea of a “random generated interactive art piece.” Spencer composed and did sound design, but needed everything else. This game became Avant Garde. – Terence is a professional game artist and designer that joined the Game Jam to work solo to learn some aspects of programming, but wanted to use this opportunity to mentor and collaborate with other game jammers. This five-person group consisted of game jammers that had all wanted to work with each other for a while. Everyone had worked in other game jams before and they collectively took their successes and the experiences of not quite failures to have an accurate scope of working with the two-day time limit of the Game Jam. Steven, music and sound designer for the project and friend/frequent collaborator with some of the Seattle Indies volunteers, talked about the intricacies of game jams on his first break. The idea is that within a 48-hour framework, the game should be completed to a minimum viable state within the first 24 hours, leaving the remaining time to bug fix and polish. This was another group that went with a similarly small-in-scope game. The plot from the beginning was about a child in a time machine cardboard box. The child “will move across different time periods, conveyed in a bathroom, and will be implemented using VR technology. The game will be a scavenger hunt, with about 2 to 3 rooms,” said 3D modeler Josh. They intended to have the game complete by Saturday evening, trimmed and ready to go, so they could work all through Sunday on testing for bugs and implementing any stretch goals. At midnight, Michael with Pacific Science Center announced the policies for sleeping arrangements, and by 3 AM, there were still two solo programmers and three groups of programmers hard at work. Many teams woke up from their on-site sleeping quarters or filtered in from home. Some teams weren’t confident about where they were at with their games. Some game developers had run into unexpected issues that mentors, upon arriving, were able to help address. 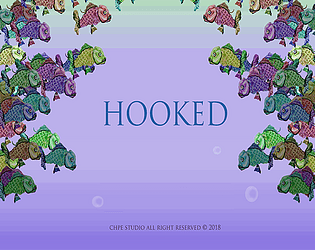 Pouria and Efran had worked on an augmented reality card game project before but had not worked with Kasra. 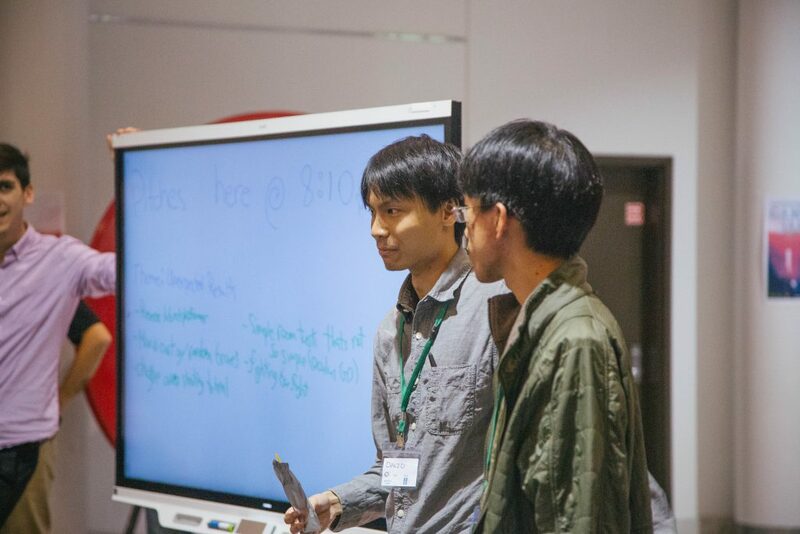 Kasra won two game jam events in the past, and as Pouria said, “we got along immediately!” They used the window of the room as a Scrum board with post-it notes to brainstorm. Ehran said, “we came up with ideas for 4 hours last night before we began working today. We generated 75 ideas and narrowed it down to 34 ideas, then 11, and then the idea that was easiest to do!” Ehran continued by providing some context: they’ll explore some of the additional ideas they brainstormed after they completed the core game mechanics. Once the game jam is over, Pouria said: “if this game turns into a good product, we may polish the game and publish it on GameOn.” Pouria explored the idea that Abdullah may be able to provide consulting or advising for getting games fast-tracked onto the GameOn platform. 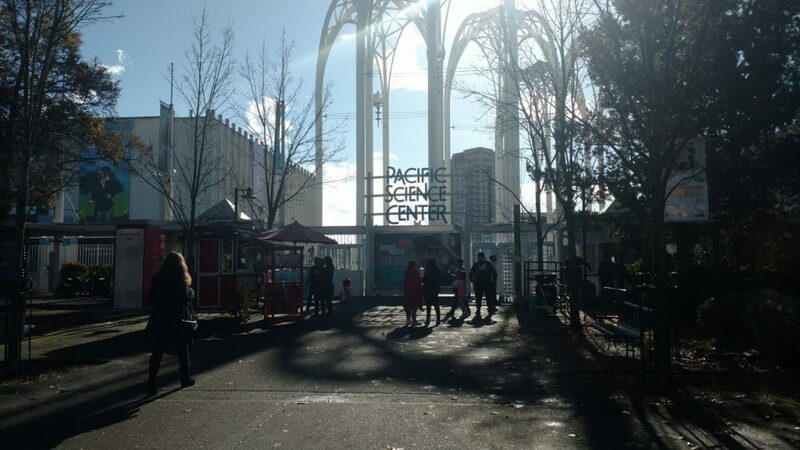 Guests started to filter into Pacific Science Center. 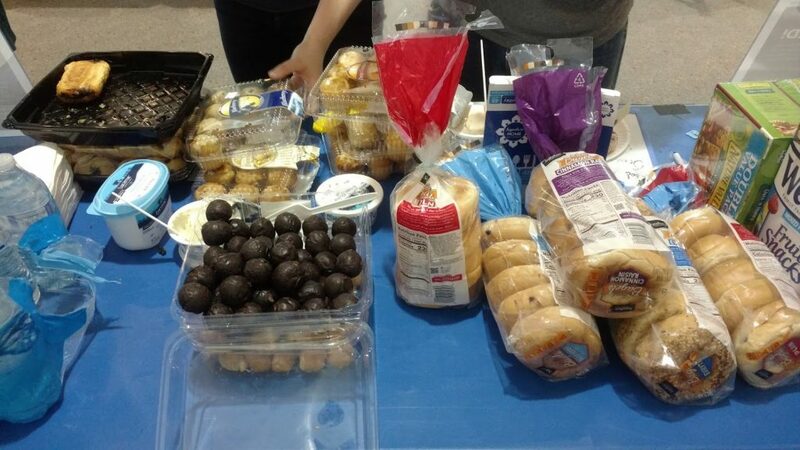 The event organizers brought in breakfast – bagels, pastries, and coffee – for game jammers and volunteers. As game jammers stopped over to pick up breakfast, they all felt confident about their games. They were taking positive steps throughout the evening and early morning to brainstorm ideas and any issues that popped up seemed to get ironed out quickly. Many game jammers seemed confident that they would be on track to finish their projects on time. Everything seemed great! Some of the volunteers and organizers suspected that this overwhelmingly positive confidence level from game jammers was more because they stopped over after celebrating a minor/major milestone or when they needed to take a break, rather than an actual overall uptick in progress. A few of the game jammers that were friends with the Seattle Indies volunteers confirmed this to be true. To explore this point, three of the interruptions highlighted in these development logs did break some of the game jammer’s concentrations mid-project, and interviewing game jammers mid-production did reveal more information about problems they were encountering. With this in mind, there was a respectful balance in gathering information and respecting personal space, because, for example, game jammers weren’t disrupted if they were intently focused on their screens. Pacific Science Center guests and staff alike were interested in the development of the games. Guests, in particular, had cursory glances, were curious, and inquisitive questions for the volunteers. Not many at this point had any extensive sit-down conversations with game jammers, but that might be expected. 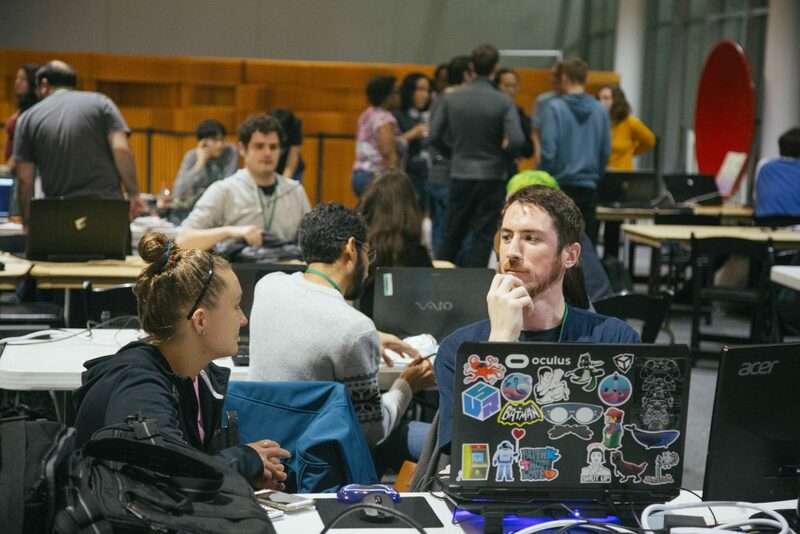 Everyone at the game jam is focused on what they’re working on – whether programming, art, sound design, or bug testing – so they weren’t likely to make eye contact or try to sell their game at this point. What do you like videogames? 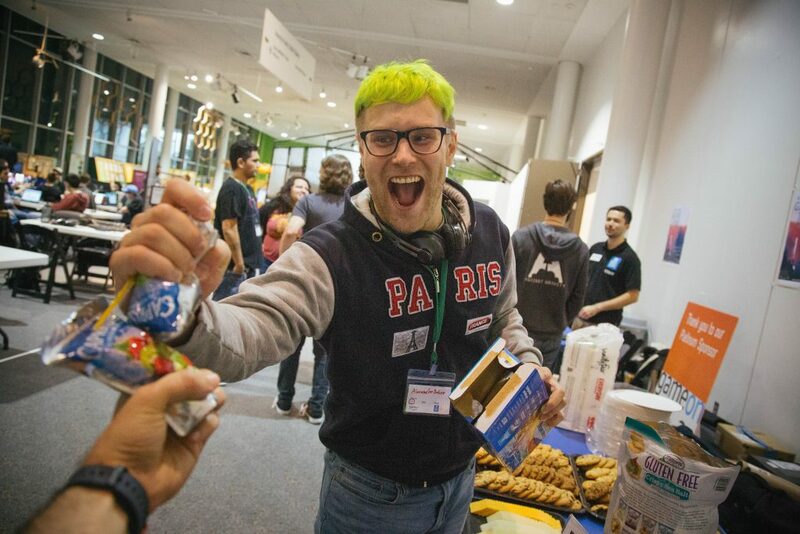 What is your favorite part of game jams? What do you like about the Seattle Indies? Tim and the mentors received more specific questions, particularly in regards to volunteering for this event, teaching other developers, producing games, and more. These interviews are part of an upcoming documentary produced by the Seattle Indies! 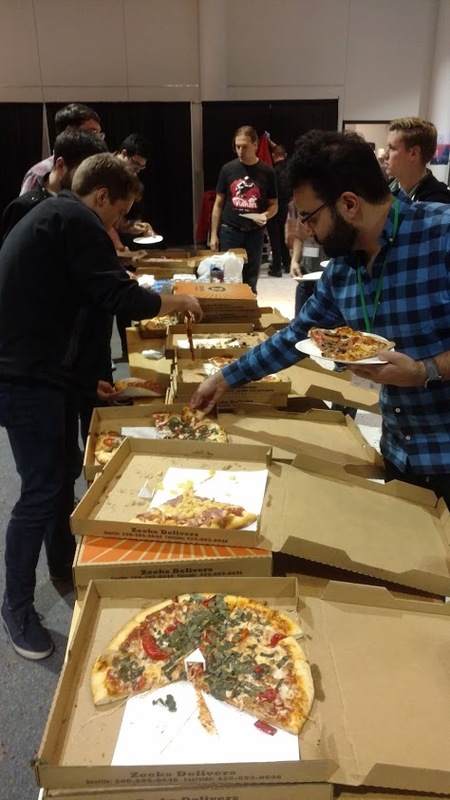 The event organizers brought in pizza. Dinner provided an opportunity for game jammers to chat about their work progress or just to hang-out. The atmosphere was palpably positive! Everyone celebrated the amount of progress they had made in just 24 hours. Some were in a minimum viable product state! Everyone mutually celebrated each other’s progress. Everyone had made such progress in less than 24 hours! It was a very positive environment to be in! Steven had arrived late into the evening with his music and audio assets complete. With his primary role complete, he transitioned into a project management role to ensure that the rest of the team could operate successfully without running into roadblocks. He explained that the rest of his team were implementing his assets and bug-testing. 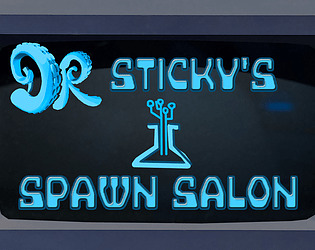 Tentatively just titled “Spawn Salon,” the premise is that monsters bred inside of a salon. Customers drop off their monsters and ask for mutations or variations. The monsters can be combined or cloned and then sent back to customers or swept into a pit and disposed of… politely! They had a viable product and were fortunately not running into noteworthy production issues. Ed summarized the game as “you break out of a room and try to find hidden messages in a series of hallways that may or may not be possessed by baddies.” They had a playable demo at this time but everything was still rough, including navigation, the text within the hidden messages, and a stubborn door that wouldn’t quite open. 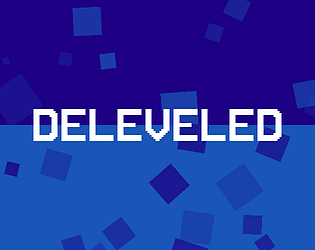 Craig summarized the game as “a cerebral experience where you uncover what’s going on as you progress through the level.” They had two instances that they worked on simultaneously. Craig’s instance was a bare, wire-frame pathway somewhat resembling a brain with floating boxes that would show messages when the player interacted with these boxes. TJ was working on a level that appeared nicely-textured. Jami summarized the game as “a VR game where you teleport around a topsy-turvy world to get the prize like a flower and explore the field. There is a yellow light-type creature that follows you around and trees that are floating in the air.” They had a rough demo available for testing, but they were still sorting out some of the details about boundaries and invisible walls. Pouria summarized the game as “a three-player competitive tank racing game with doors that would randomly move you around the screen and items that would either help you or help your opponents.” They spent most of Saturday polishing the gameplay and mechanics, so warping between doors was intuitive. At this point in Game Jam, Pouria actively looked for playtesters and fielded constructive criticism. Almost all of the teams had packed up for the evening. Ray took a break from testing out gameplay mechanics to provide a status update. They had realistic textures on the walls and had also added a sense of urgency to the game with the addition of a lockbox on top of the cardboard box time machine. The lockbox has three numbers that you can spin to reveal a prize. As a fun aside, Ray asked volunteers Chris and Anthony for a 3-digit number. Chris responded with an area code in the Seattle area that ended up appearing in the final game! Seven teams were hard at work. Maybe the extra hours they received from Daylight Savings Time helped? 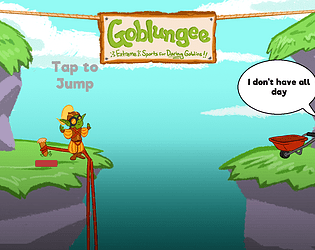 Budi had come up with an idea overnight of a game over screen and was implementing it. Forrest and Ray were implementing Forrest’s sound effects. TJ and Craig turned in early on Saturday to rest up. They were finishing work on combining their dialogue branches and texture branches into one finished product. Guests filtered in, along with the remaining game jammers. The event organizers brought in breakfast and coffee. Clinton described his game as a “subversion of a zombie first-person-shooter game. The original idea was that it would be an off-rhythm rhythm game with crazy sound effects where you would heal your opponent with bullets.” Movements would have different sound effects than expected and reloading mechanisms were originally based on rhythm mechanics but might be changed before the final release. Craig and TJ ran into technical problems with their cerebral game. The hard drive in Craig’s laptop stopped working, but they were able to keep working after TJ copied the data from Craig’s laptop over to his laptop to merge their builds. Craig’s laptop was down for part of the morning until a screwdriver and some ingenuity of moving the hard drive to a different bay in Craig’s laptop resolved the issue. Ed was pleased. They successfully added audio and everything was coming together. He was concerned over aspects of the level design, but their minimum viable product played through hallways of an environment looking like an air duct without running into any major issues. The graphics had a distinctly retro, 90s aesthetic with fuzzy pixelated blocks to differentiate paneling. The team had made significant progress in their build and were intently focused at this point. The team had a minimum viable product running of their game. The team showed a quick demo of their game, which is a random item builder that, as Spencer described, “practices material detachment.” The idea is that objects, like cars or fire hydrants, drop from the ceiling and the player combines them into ways that will yield the best possible score after the object is launched out of a window. Pouria showed a polished demo of the game. Later on, Abdullah with Amazon stopped by to check in with the Seattle Indies, and talked with the Baffled Brawl developers. Tentatively called “A Cat Named Otto,” story designer Riley described their game as “a 2D cat platformer where the cat races through a maze in a series of increasingly complex artistic and narrative choices.” Max, one of Riley’s teammates, provided some useful advice for future game jammers. 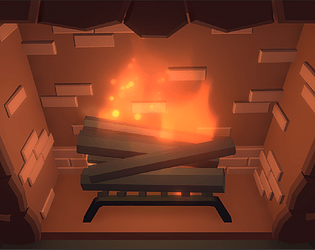 “After completing work on sound design, rather than sit around, I picked up the role of project manager on the team.” He said that “more teams need dedicated project managers to make sure that everyone remains on target.” This was echoed earlier by Steven, after he completed his audio assets for Goodnight, Rowan, and later by Josh after he completed his art assets for Time Mashine. Jacob worked on the soundtrack song throughout the jam: a whimsical tone representing the wizard while a woodblock rhythm represented the cowboys. 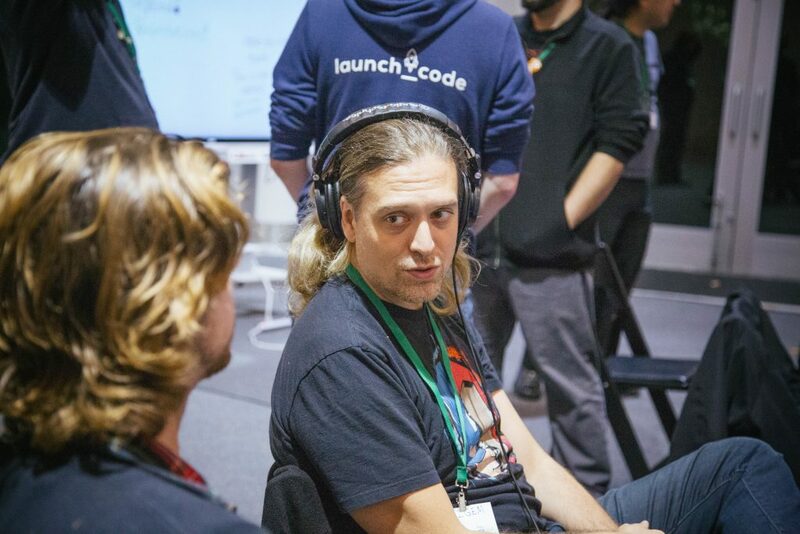 The remainder of the 6-person team, led by veteran game designer Robert Rood, were focused on refining gameplay mechanics in preparation for crunch time. Crunch time. Everyone was focused on wrapping up their game before the 6 PM deadline. The event organizers brought in a celebratory burrito dinner! After dinner, everyone met in the auditorium for presentations, which were streamed on Twitch, and later uploaded to YouTube. 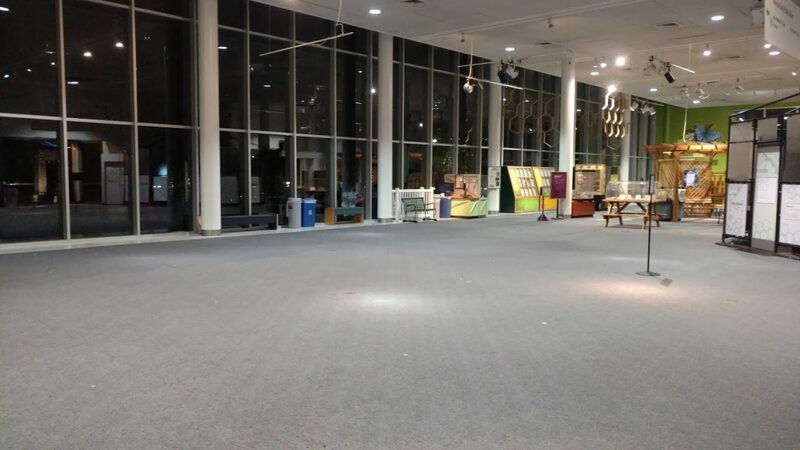 From here, everyone helped put away the network equipment, tables, and chairs, before departing with newly-completed games and newly-made friends! There were a few unexpected results from Game Jam. 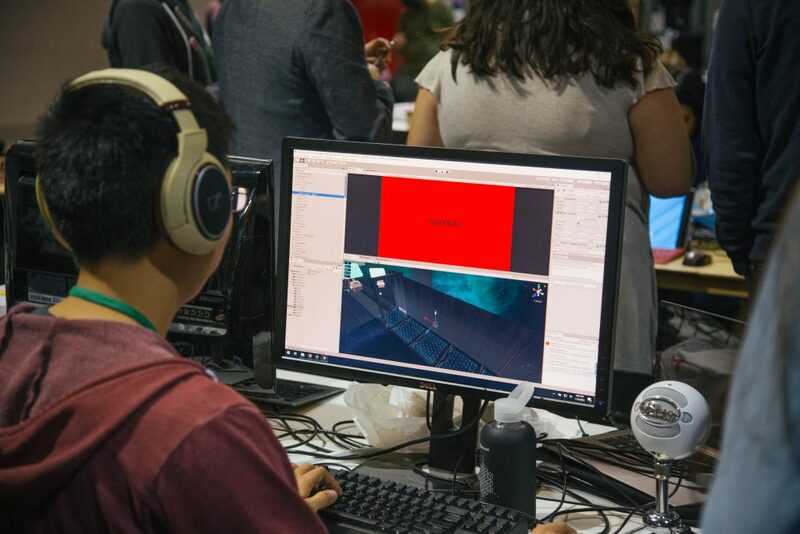 One of the most unexpected results of this year’s Game Jam was the sheer number of high-quality games that were completed in those two days. – Goodnight, Rowan and many of the other games made at Game Jam were well received at the Seattle Indies Show and Tell. – In the evening after the Seattle Indies Show and Tell, a Twitch live-streamer with an average of eight thousand viewers, Vinesauce, serendipitously played all of the games from Game Jam and seemed to enjoy all of the games that were made. That video was later uploaded to YouTube. 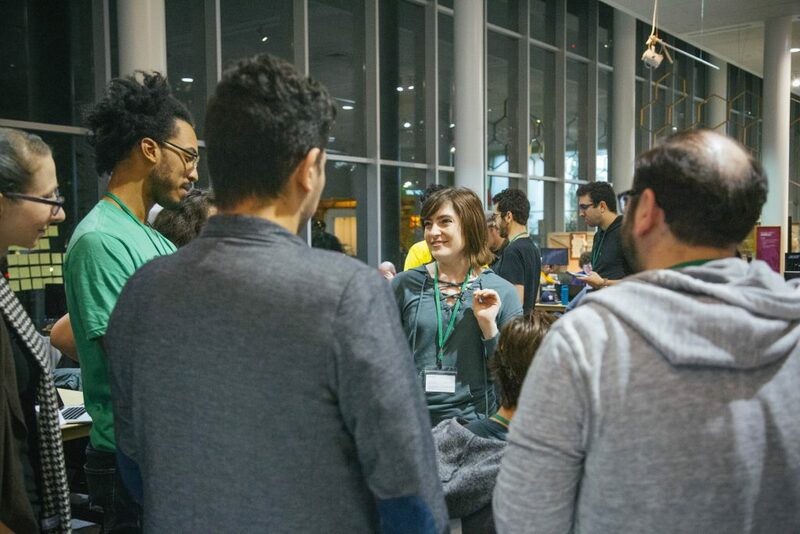 The second-annual Game Jam was a great opportunity for game developers of all skill levels to meet new friends, network with professionals, and work together on experimental games. Thanks to Pacific Science Center, the Seattle Indies, and our sponsors for making all this possible! 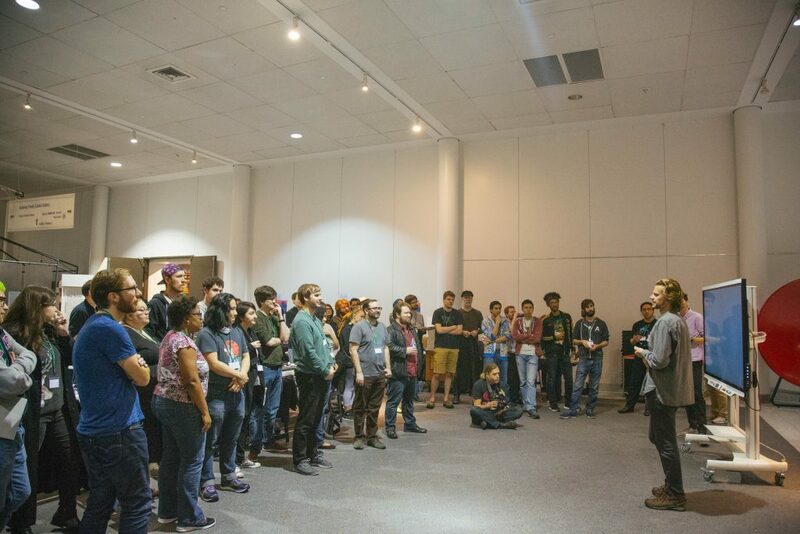 Seattle Indies is non-profit organization dedicated to fostering a vibrant and inclusive community of independent game developers in the greater Puget Sound area. Our primary focus is on hosting events and activities that empower people to make games, share feedback, network, and showcase their projects. We also strive to provide friendly spaces where developers can congregate for support, discussion, and news on game development, in addition to highlighting the works of our talented creators to the general public.